Known as the Mother of Thanksgiving, Sarah Josepha Hale was born in 1788, a native of New Hampshire. She wrote several books, but is mostly recognized as the poet who created the nursery rhyme about a girl named Mary and her lamb, which you probably sung as a child. Scripture says we can offer thanksgiving as a sacrifice, and doing so glorifies God. Being able to recognize God’s goodness, despite our circumstances, is an act of worship which pays homage to his attributes--his grace, patience, love, and provision. 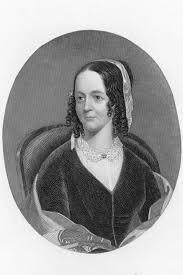 Sarah Josepha Hale was an advocate of thanksgiving, and became the catalyst for the United States implementing a day of gratitude as a national holiday. While not everyone has the same benefits and comforts afforded to others, as Christians, we can be challenged that whatever our circumstances, Thanksgiving is a day in which we can offer worship to an amazing, good and holy God. God loves a thankful heart. Dear Lord, help us to each have a thankful heart. Help us to be thankful for the things that You have given us. In the Name of Jesus, Amen.